Once a year, Bengaluru becomes busy, being the poor cousin of Mysore, the grand-dasara city. The capital lives her dual life with Navrathris, the festive flashes of silk sarees and gold jewellery, surrounded by dry, autumn days of brown trees and dead leaves among trash piles. 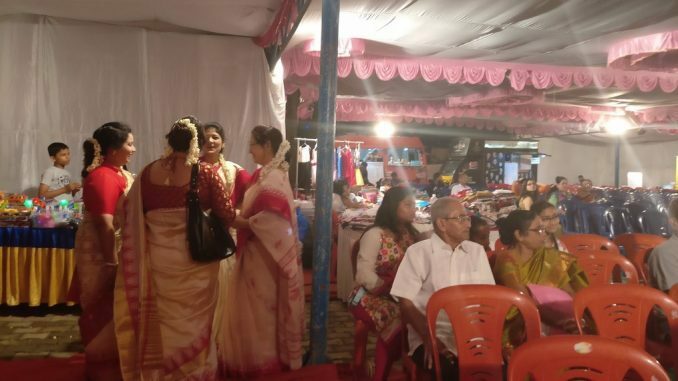 You do see women visiting each other hurriedly to exchange prasadams and if you peep into their houses, you can also catch glimpses of their droll doll sets, assorted gifts and the sound of bhajans. Still, the seasons run in parallel and it’s a bipolar city. The Durga, Laxmi and Saraswathi idols are prayed to and deified behind doors, even as the city’s garbage, flash mobs and worries continue to pour outside. In print as in real life, you can also watch the procession of elephants in Mysore and in Bengaluru’s streets in the mind’s eye. It is a quiet, understated festival–just like all issues here that never get much attention. There is a march in the external world, with a dry-mouth feeling when you walk through the streets. Out on the roads, you find the usual crowds stuck in the traffic, intent with seething, steely eyes. People are trying to navigate the choked traffic on the roads. They are resigned to spending a lot of time of the day trying to pull out of the day. The rains continue to pour chattily in the evenings, and you need to reach for the umbrellas and hitch up your saree as you run through the showers. The rains even remind you of the British. You can see them when the water trickles into buildings of the Cantonment, in the architecture of the railways and the churches. The British haven’t left fully, then. They linger sometimes. Meanwhile, September in the city still rains, sometimes flooded and at other times water-logged. Sometimes the rains are excessive and sometimes it’s moderate. However, the showers have already exceeded this year’s quota of monsoons in just three weeks. And like everything else in the city, that is bad news. The rates of vegetables have shot up, with coriander putting up its price to record Rs 174 a kilo against the August price of Rs 36 a kilo. Beans, the lowly cabbage and carrots also shoot up to double the rates of the earlier prices. It is also clear that when the vegetable prices are down, they are out of stock. And when they are up they are out of stock. The prices had been high in the past three years due to lack of rains, and now they are high because of excessive rains. Both ways, it’s the farmers and vendors that are hit. High-priced vegetables are not going to make their way to households, so they die a quiet and slow death quickly.